No one can fault Thodos Dance Chicago (TDC) for a lack of variety. Titled “Chicago Revealed,” the company’s spring series last weekend at the Harris Theater for Music and Dance featured four works from three choreographers, each offering his/her take on Chicago, past and present. The program was divided into two halves, with Thodos’ latest narrative work Sono’s Journey followed by what could have been a whole rep concert on its own. As TDC approaches its 25th season, Artistic Director Melissa Thodos has visited Chicago-centric themes often over the past several years, dating from the company’s restoration of three rare Bob Fosse works and its first mid-length story ballet The White City: Chicago’s Columbian Exposition of 1893 in 2011. Both projects were created in collaboration with Broadway legend Ann Reinking, and remain some of Thodos’ most successful projects. Plus, the company’s once fractured identity has now become rather consistently committed to Chicago stories and voices. Sono’s Journey is a visual delight, taking audience members on a narrated path through dancer Sono Osato’s life. Three dancers in red represent Osato, now 96, at various stages of her life: as a young girl (danced by the spritely Jessica Miller Tomlinson) auditioning for the Ballet Russe de Monte Carlo, as a young woman (Abby Ellison) dancing for American Ballet Theater and on Broadway, and as the mature Osato (Shelby Moran) reflecting back on her life. 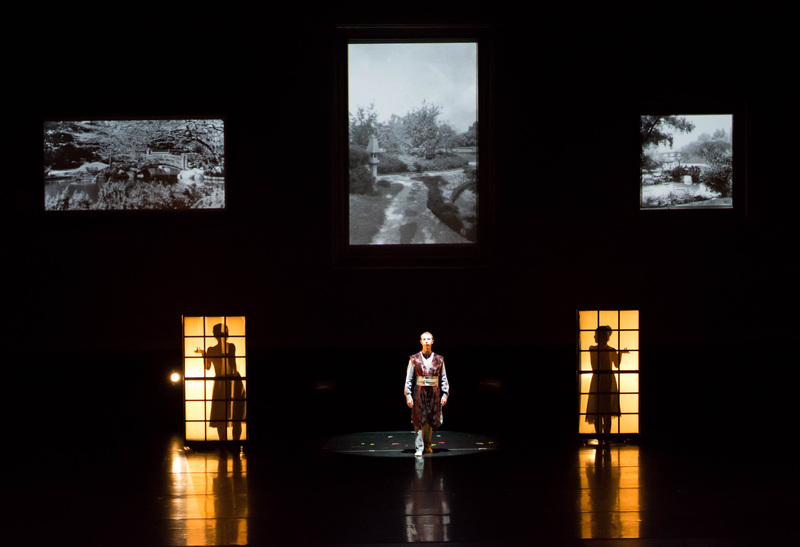 Projections and paper screens are creatively employed throughout the piece, incorporating images of Chicago’s Jackson Park, where Osato’s father ran the tea house prior to the Japanese internment during World War II, and photos from throughout her life and dance career. Real images are combined with fabricated family photos – antiqued images of TDC’s dancers – in frames hung above the stage, complemented by Nathan Rohrer and Nathan Tomlinson’s lights, set, and costumes. Every detail of Sono’s Journey is handled with care, and an apt tribute to Osato’s remarkable career. Although, I couldn’t help thinking it belonged in a museum instead of the Harris Theater stage. In an effort to do the story justice, Sono’s Journey suffers from a lack of abstraction. It reads to the viewer more like an exhibit more than a dance. Nonetheless, it’s a fascinating story that deserves to be told, and who better than dancers to tell it? The evening’s second half features work from Kevin Iega Jeff, Robyn Mineko Williams, and Melissa Thodos, each offering a Chicago inspired work from unique perspectives. Considered together, the takeaway is that we live in a complex, multicultural, soulful city. Jeff’s Redlines/Bluehorizon is a relentless series of whirlings and twirlings – a controlled chaos that abruptly ends as though stopping mid-sentence. His inspiration was conversations with individuals in contrasting neighborhoods, and one gets the sense that the group is somehow living a common, yet fractured experience. Robyn Mineko Williams offered At the Apex, a classy quintet celebrating Chicago jazz music and its pulse through our lives. 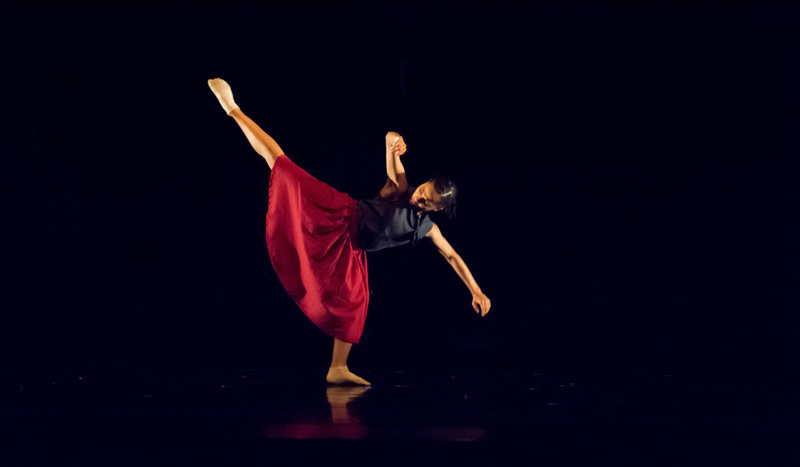 Decidedly stripped down from the usual hustle-bustle of a TDC dance, Mineko Williams has no need for high kicks or pirouettes. Above the playful romp, a twinkling chandelier casts a glow on Rohrer’s pedestrian look. The treatment TDC’s dancers bring to Mineko Williams’ vocabulary are complemented by the design team’s subtle choices, and while At the Apex alludes to the choreographer’s lineage with Hubbard Street Dance Chicago, it is something distinctly new. Thodos’ Thio Kosmos, a comment on the Greek American experience in Chicago is strongest in its second half, once the dancers ditch their chairs and big gold belts for black dance dresses and a classic Thodos movement vocabulary. Choreographed for six women, Thio Kosmos is as personal to Melissa Thodos as Sono’s Journey must be to Ms. Osato. Thodos’ sisters recite recorded narrative about “straddling two cultures,” living a “hyphenated experience,” and the responsibility placed on first generation Greek Americans to live extraordinary lives, made possible by their parents’ sacrifices. Looking objectively at “Chicago Revealed” and a quarter century of dancemaking, Melissa Thodos can rest easy that she is not taking life for granted.